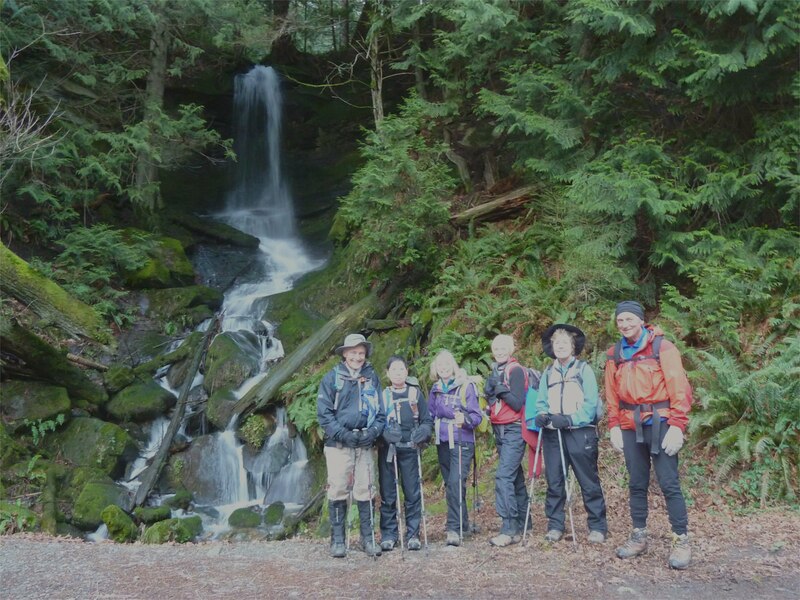 Eight hikers, including Carols’ daughter, Renae, showed up on a cool, misty morning in Bellingham for a hike on Stewart Mountain, just east of town. We named it the “Ogallala Loop” because someone, probably a transplant from Nebraska, once carved a wooden sign saying “Ogallala – 1400 miles” and nailed it to a tree near where the trail takes off from the logging road. In the above picture we are approaching the sign location, but when we got to the point I had saved on my GPS there was a small trail heading into the woods, but no sign. A couple of hikers went on down the road for a bit but soon gave up and returned and we prepared to head into the woods. While we were waiting, the mist turned into a very light rain and we put on our pack covers and other rain gear. I did so mainly to ward off the weather gods, since the forecast called for a cloudy day but very little rain. The trail has always been on the muddy side and poorly maintained but it has gone completely to seed now. We were lucky that we’ve had a week with almost no rain, for we still had lots of encounters with slippery, shoe-sucking mud. We were clambering over fallen limbs and trees all day, too. We grabbed a quick lunch up on top of the mountain but we couldn’t see any of the fine views, as we were enveloped by the clouds. The return side of the loop was, if anything, even worse than the ascent, with more mud, seriously steep patches and overgrown undergrowth that made us too dependent on the occasional pink blazes along the trail. I am just about ready to declare this as an ex-trail – a trail that we used to hike, but now have better sense. We did a nice round 10.0 miles with 2700 feet of elevation gain. This was only my second hike after missing about a month and I am feeling it all over. But at least we didn’t get lost, no one damaged any important body parts and we returned with the same number of hikers we started with. This morning I set out to see if the hike I scheduled for Thursday would be worth doing. The last time we tried this hike we ran into a real mess near a new clearcut – many, many small to medium trees that had fallen across the trail (which at that point was actually an old abandoned road). We struggled through it for awhile but ultimately gave up, not knowing if we were going to be able to get to a better situation. My plan for today was to make a quick hike up to that area and see if there had been any cleanup, now that the logging operation was complete, that would allow us to complete the hike to the top of Stewart Mountain. The trail was wet from our recent rains but not terribly muddy. 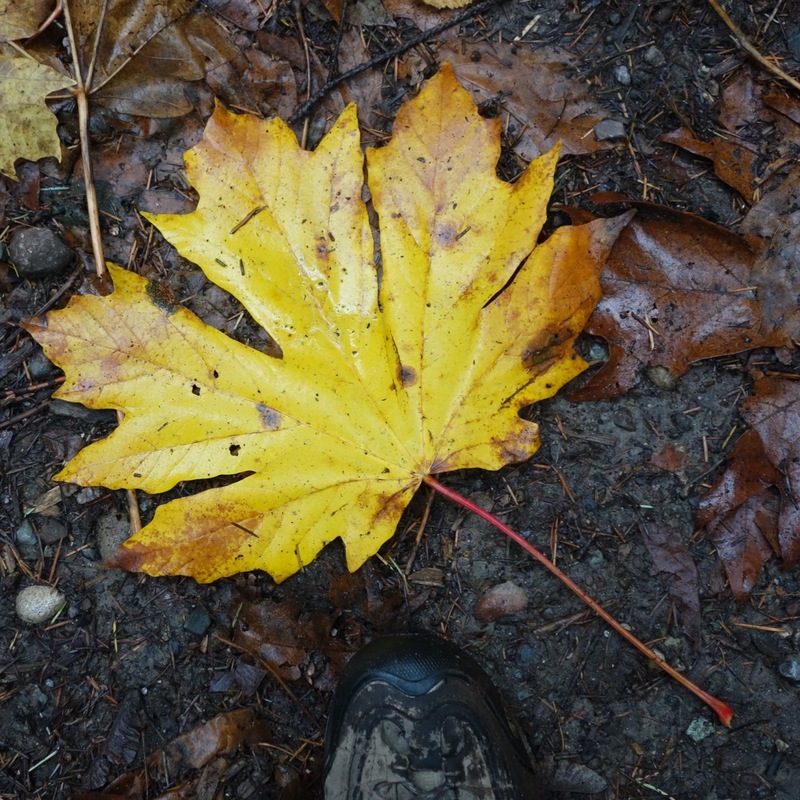 I took a picture of a leaf in the trail from a Big Leaf Maple – can’t imagine how they came up with that name! As I approached the area of the clearcut the trail disappeared under a bevy of small fallen trees. 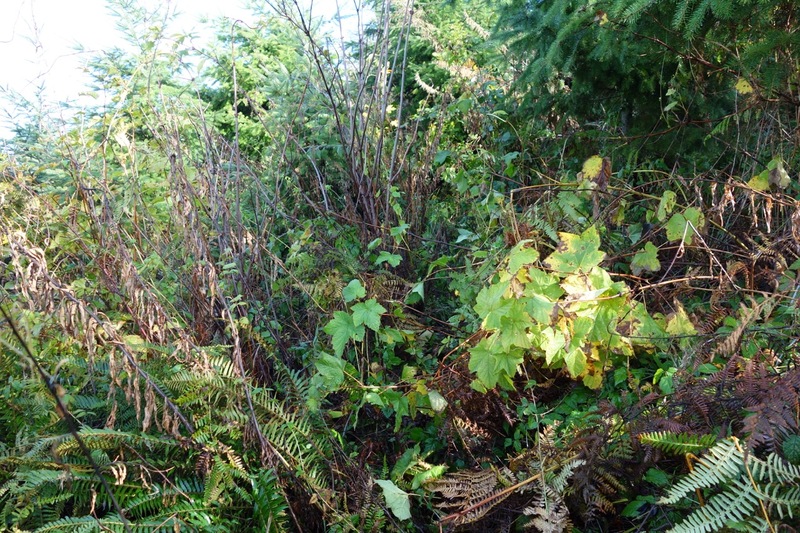 Not only did they block the trail themselves but they had also bent other vegetation across the trail. I thought it odd that so many trees had fallen, and all in roughly the same direction, but when I tossed one off the trail I noticed that it ended in a clean saw cut. Why had someone cut down all these tress? The “Trail” is just to the right of center. 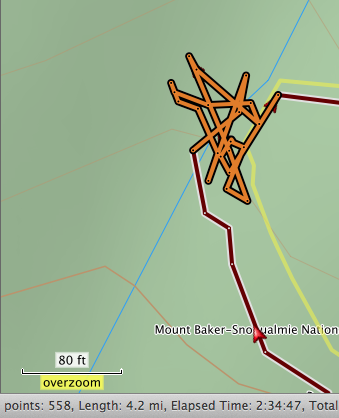 My plan for a quick hike to the old road by the clearcut was not working out. But I had brought a pruning shears and a small saw, so I decided to spend a little time cutting my way through – maybe the blockage was only a few yards deep. It wasn’t. An hour and a half later, after giving up and starting back down and changing my mind a couple of times, I finally made it to the road I was aiming for, having traveled a distance of about 100 yards! That road still has a lot of downed trees but it didn’t seem as bad as I remembered. It looked like some hikers or hunters has started stomping out a new way around and through the mess. It was mostly a matter of stepping over trunks lying on the ground, with a few more annoying ones to clamber over or scoot under, but nothing that was difficult or dangerous. In the end, the bad part was less than a quarter of a mile (I measured carefully) and only took me about 10 minutes. 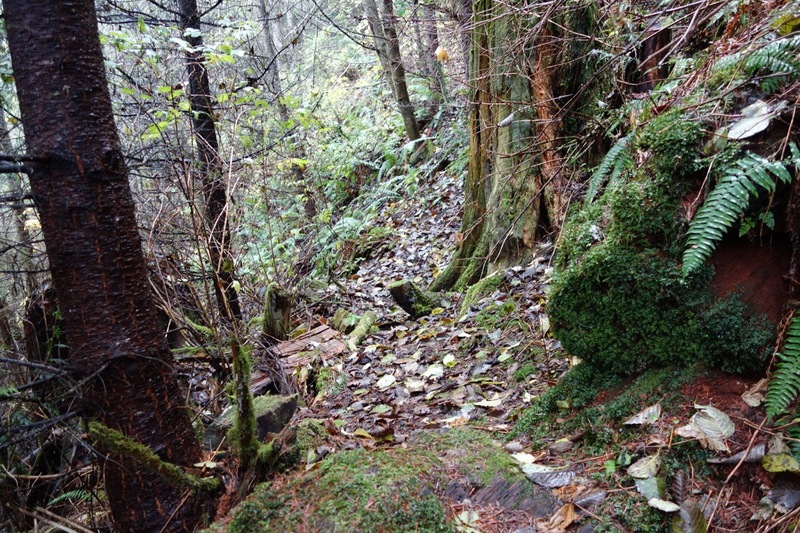 A big portion of the trail that we had used in recent years was completely obliterated by the logging operation, but there is another old road that leads away from the clearcut and accesses an older trail (in who-knows-what sort of condition) that links up with the trail to the top of the mountain. So I pressed on another quarter mile or so to check the out and, with a bit of difficulty, found the old trail and followed it a short distance, just enough to be reasonably sure that it was the correct trail. The trail seemed to be in pretty good shape but I was still several hundred feet below the top of the trail and kind of pooped, so I headed back to town. On the way down it took me about 6 minutes to pass through the section that had taken me an hour and a half to clear. The whole trip back to the trailhead took less than two hours. So all in all I think this hike is actually doable. The weather for Thursday looks pretty good. We thought we’d gotten a bum deal when we went hiking on the Heliotrope Ridge Trail last Thursday. The end of October is generally not a good time to go hiking in the North Cascades but it looked like El Niño was on our side, providing fairly warm enough temperatures to keep the snow away. And the National Weather Service forecast called for a lull in the rain, although it did say that rain was more likely in the mountains than in the lowlands. You can read all about the hike on D-Jan-ity but, to make a long story short, it was raining very lightly when we started and it stopped entirely after about a half an hour. There were even patches of blue sky urging us onward, but we were flummoxed when we got to the first of three creeks and couldn’t find a safe place to cross. It is pretty commonplace to turn back at the third one but this is the first time that we couldn’t even pass the first one. So we had to settle for a 3 mile hike, getting back to the cars at about noon. It seems that I was too focused on snow and falling rain to take into account the rain that had already fallen and made its way into the creeks. In fact we are under the influence of something called an “atmospheric river” or “Pineapple Express”, wherein a plume a moist Pacific air from the tropics set its sights on the State of Washington and brings huge amounts (for us) of rain. You can read more about this on Cliff Mass’ Weather Blog. Notice that, except for the wee hours and the late evening, the only time when that graph isn’t streaking upward is the three hours that we were hiking. And look at the time just before 9AM – over an inch in about 5 hours! 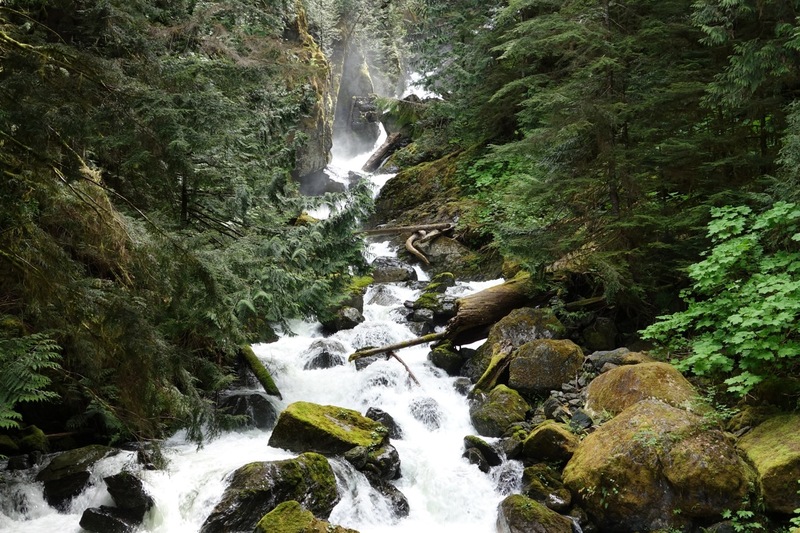 So no surprise that Kulshan Creek was raging and we were actually pretty lucky. Last night in the wee hours we got almost an inch of rain here in town, so I went back to the SNOTEL and downloaded the hourly data from Thursday through 11AM today (Saturday). The arrow points at our hiking time. By the way, that accumulation is from October 1, the start of what the weather folks call a “water year”. 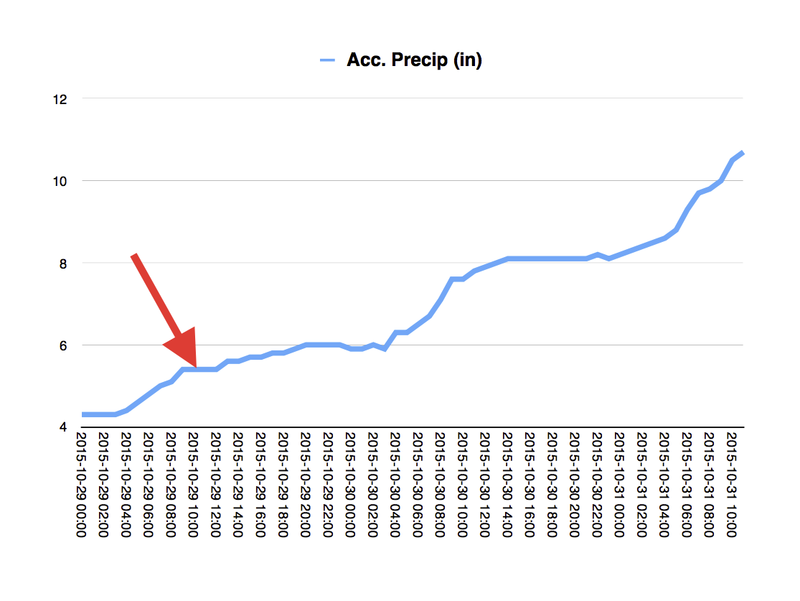 So the mountains have had considerably more rain in the last 2½ days than in the rest of October. I was suckered into buying a new Garmin GPS handheld unit (GPSmap 62stc) by a half-price offer from REI – Garmin stuff never goes on sale and my old device (GPSmap 60-something) was getting a little long of tooth. I’ve always had problems with large errors that Garmin has never solved (or even fully acknowledged) so I’m not in love with the old one. And the newer model has some cool-sounding features – nothing earth shaking. The long-standing errors are in the way the device reports distance traveled and elevation gained. For distance it has an odometer that tries to keep track of your total distance as you move, the same as in your car. But it also has a tracking feature (Track Log) that saves your location frequently, and is capable of going back over those saved points at the end of the trip and totaling up the distances between the points. These two measurements should be pretty close but they hardly ever are – differences of 20-40% are not uncommon. Years ago I examined it pretty closely and found that I could fool the odometer at will just by moving very slowly (which we often do when climbing steep trails). I once carried the device a quarter mile, according to the track log, and the odometer showed only 20 feet or so! Elevation is just about as bad. My favorite example was a hike to Boundary Way where the trailhead is at 4300 feet and the high point of the hike at 5300, a nice round net gain of 1000 feet. There were some ups and downs along the way that added a bit to the total but the device showed a total gain of 750 feet. I could never get either Garmin or REI excited about these software errors; I got as far as talking to a Garmin engineer who was puzzled and seemed convinced that there was a problem, but he never got back to me and I didn’t have the energy to start the whole process over. REI has replaced the device a couple of times but they didn’t seem to give a hoot, either. My first outing with the new device was a simple hike in Lake Padden Park and the results looked very good. The odometer and the track log were in pretty close agreement and the track agreed closely with tracks I’ve saved from other hikes there, and where they differed the new one looked better. So I was optimistic on our first high country hike of the season. 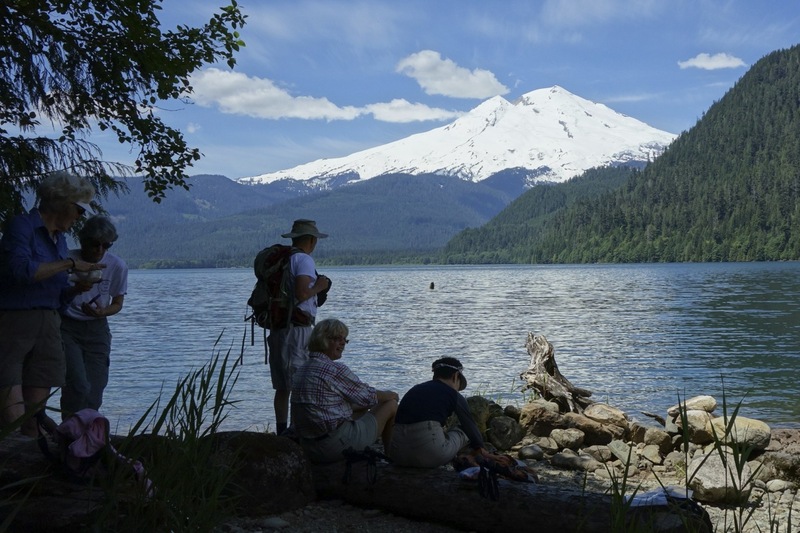 Excelsior Pass Trail is a 4- to 4.5 mile hike that climbs about 3500 vertical feet through the forest from Mount Baker Highway at 1800′ to 5300′ at the pass. We were not going to make it all the way because of the remaining snow but we were aiming for a nice little spot with a view of the pass about 3 miles along the trail at about 4400′. About that “3 miles”. 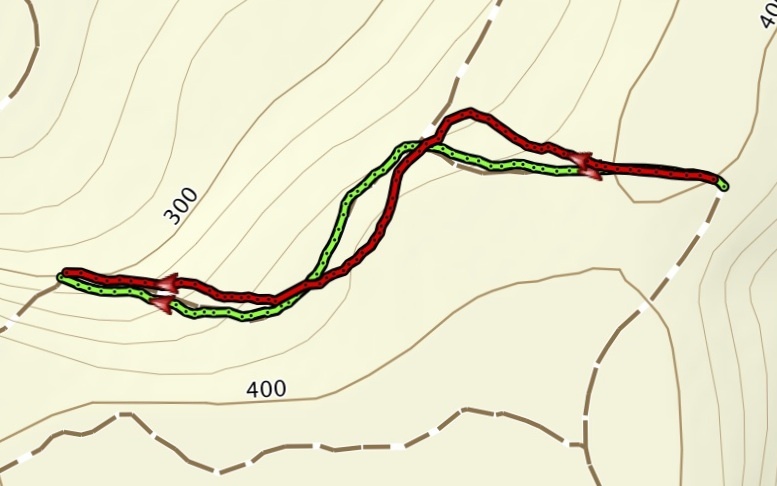 I have traveled this trail many times (including 2 weeks ago) and saved a number of track logs that all look pretty similar. They range from 4.1 to 4.4 miles long, which I consider to be an acceptable tolerance range. This is a challenging environment for GPS: climbing out of a deep, steep-sided valley through heavy tree cover. Rain would make it worse, since water absorbs microwave signals, but this was a dry day. All in all, I have a lot of confidence in the 3 mile estimate. 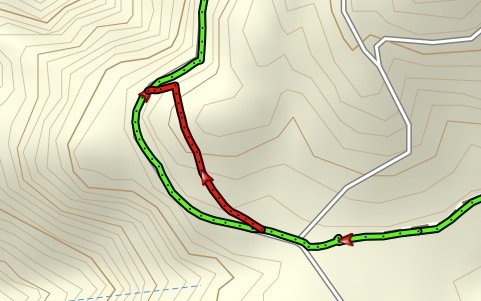 I checked the device frequently (which was more difficult that with previous devices since Garmin has really screwed up their system for attaching the device to your person) and the accuracy was staying down in the 20-30 feet range and the new track (the red line on the map) was close to the old one. We had one stop that was a bit longer than usual while we waited for a hiker who wasn’t feeling well, but otherwise we plugged right along, getting to the aforementioned spot just before noon. We hit snow just above 4000 feet and lost sight of the trail near the middle of that east-west-ish traverse (at the word “Mount”). The map also shows the old track from last fall in yellow – most of it is obscured by the new track, showing 1) we kept close the trail until just before we stopped and b) there was quite a good bit of trail left. The white arrow points to our longest stop, at the Excelsior Flume – more on that later. And soon as we settled down into the snow for lunch I checked the new device and it showed an odometer reading of 4.2 miles, which was simply absurd. And puzzling – I expect huge errors in the odometer, but they are usually on the low side. So as usual, I would resort to the track log – which also said 4.2 miles! It was most ironic that the first time these two measures had ever agreed they were both hugely wrong! Most of what I said and thought for the next few minutes is not suitable for a family publication. I resisted the urge to pitch the thing into the nearby creek, saved the track and continued the track logging after lunch. When we got back to the trailhead the odometer and the track log both read about 7.9 miles, giving 4.2 miles on the way up and 3.7 on the way down, along the exact same trail – on the snow I was even stepping in own footprints. I’ve seen discrepancies like that before, too, and have written it off to the fact that we are traveling a bit faster on the way down (and the devices are known to have trouble with slow travel.) I was eager to upload these tracks to my computer and see if I could make sense of this before I started haranguing Garmin and REI. Again. Upward half-track – 3.6 miles? The last I checked 3.6 + 3.3 is a little shy of 7.9. What the φθψκ is going on? The map on the left shows this upward half-track made of the same 560 (or so) points as the 4.2 mile track – can you see any difference? I can’t. The point counts are close enough to make it pretty clear that both devices (the GPS and BaseCamp, too) are working with the same raw data and somehow deriving significantly different results in different contexts. I will be sending this data to Garmin, rest assured. You’d think a track that loses a mile, but not any points, when split in two would get an engineer’s attention. We shall see. But I just couldn’t let this go. I wanted more ammunition before hacking my way through the telephone trees. The first issue is “Where does that track length come from?” I’ve always assumed that the software is adding up the distances between each pair of successive points. In BaseCamp you see the display on the right, showing latitude and longitude for each point and the length (in feet) of each “leg”. There are way too many numbers to add up by hand and, moreover, are those distances accurate to begin with? The latter question is a toughie, since it is not trivial to calculate the distance between two points given latitude and longitude – it involves spherical trigonometry, which I encountered for a couple of weeks in the spring of 1958. But it didn’t take root. I first found out that the Universal Transverse Mercator (UTM) coordinate system was invented to simplify this very problem. Instead of resorting to extremely skinny triangles based at the center of the earth it uses measurements in meters from standardized reference points. It is much more difficult to describe than Good Ol’ latitude and longitude. It turns out that BaseCamp is capable of displaying UTM, shown in the detail on the left, but it only exports the old style coordinates. I have a picture of that, too. But a search on DuckDuckGo (like Google but without the spying and tracking) coughed up a detailed dissertation on the use of the Spherical Law of Cosines for just this purpose. So it was time to build a spreadsheet! 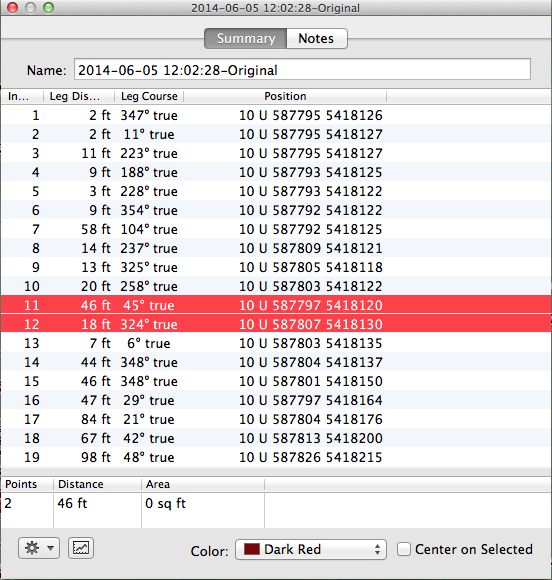 After importing all these points into Apple’s Numbers application and struggling with a bunch of sines and cosines and deltas and phis and lambdas and meters and feet and miles, I had a working spreadsheet that looked almost exactly like the first BaseCamp display above, with the “legs” of the track in feet. I didn’t check all 560ish points, but every one I did check was true to the nearest foot. 5720 meters or 3.554 miles. So this is consistent with the upward half of the split track, even though the data is from the saved 4.2 mile upward track. Where did that 4.2 come from? I have no mathematical answer for that. The best I can come up with would be an unlikely and deeply conspiratorial attempt to rig the results to agree with the odometer. But they probably wouldn’t do that. 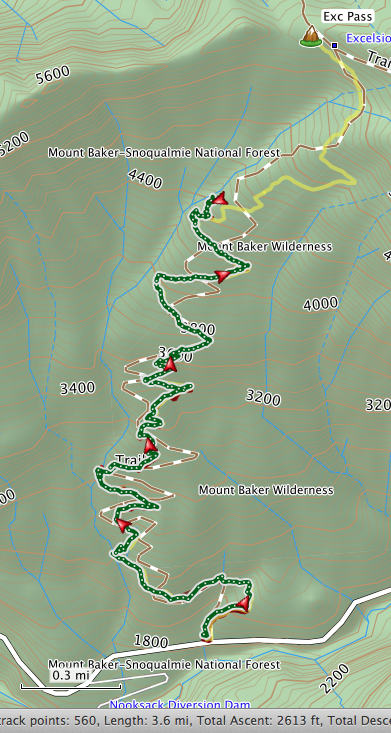 Now 560 points is more than one needs to draw a pretty good picture of a 3 mile trail. 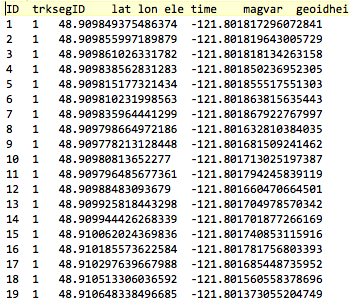 Given that all the GPS coordinates have some error (or jitter) in them, having more data might give worse results. So I modified the spreadsheet to skip every other point and this dropped the track to 3.28 miles. Stripping it down to every third point brings it down to 3.00, and every fourth point gives 2.92. At some point just throwing data away willy-nilly like this is going to chuck out some good stuff (for example, it could seriously round off the switchbacks). To do this well one would have to detect places where the track has a serious change of direction and make sure those points are kept, while tossing out points when you are loping along a straightaway. Another way that those inherent errors can exaggerate the track length is that the device doesn’t do a very good job of handling times when you are stopped. (To be fair, this is a difficult problem for a mere machine: How can you tell if you are moving or not when all you know is your position, and that is almost certainly in error?) What happens when you stop is that the GPS sees these inherent errors as legitimate movements (We’re here. No, now we’re over here! No! Over here!…). Going back to that white arrow on the first map, above, you can see a little bulge in the track at that right turn by the Flume, where we paused for 5 or 10 minutes. (Sometimes I remember to manually turn off the track logging when stopped, but not this time.) 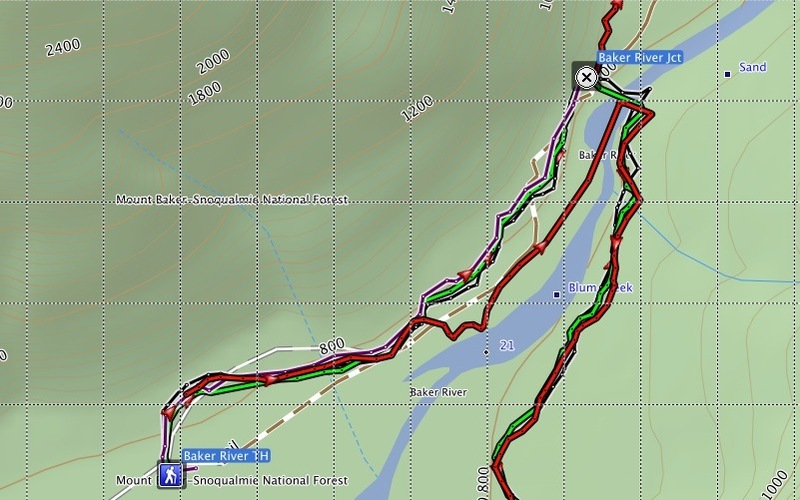 The map on the left is a closeup of that spot – there are actually 25 spurious points in that little bulge! 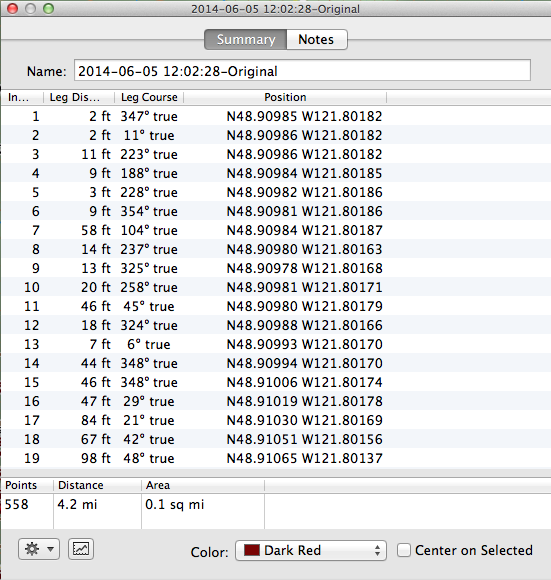 In this case I culled almost a mile out of the 4.2 mile track just by deleting obviously extraneous points like these. There are some settings in the GPS device that might serve to control the numbers of excess and spurious points without losing too much detail, and I will experiment with that. But consider that this is a $500 device which seems to be generally regarded as the best consumer-grade GPS available for hikers, that I was using the default settings and that 99 and 44/100 percent of users are using those defaults. So the next time someone authoritatively announces what the cheap little GPS in their phone says, I hope you take it with enough grains of salt to gag a buffalo. Just a quick note – it occurred to me that the one difference between the 4.2 mile up-track and the 3.6 mile half-track: the former had been uploaded directly from the device and the latter had been created on the computer. I went back and made a duplicate of the original track; it still showed the 4.2 mile length. But when I deleted the last point, which should have changed the length by 18 feet, that length instead changed instantly to 3.6 miles. As soon as I forced the computer to recalculate the length it got the “correct” length, that is, the length based on the actual point data. So I conclude that the 4.2 number really had nothing to do with the actual track points but had somehow been attached to the track while it was in the GPS device. The conspiracy theory just got a bit more plausible – somehow the track length has been fudged, perhaps to make it agree with the odometer. I can’t wait to hear Garmin’s explanation…stay tuned. I had to scrape the rust off this blog this morning – has it really been more than six months? Anyways, here is an olio of weather-related things that popped up this morning. For those of you who have not seen this splendid new building and might be deceived by the scale of the photo into thinking you are looking at something the size of an outhouse, here is a shot I took on our visit last July. It’s a big building! To document the situation, here is a graph that I’ve concocted out of data from a remote monitoring station belonging to the Soil Conservation Service and located at about 5000′ elevation on Lookout Mountain. (No, not that Lookout Mountain! And not that one either! It seems there are as many Lookout Mountains and there are Mud Lakes and Boulder Creeks.) 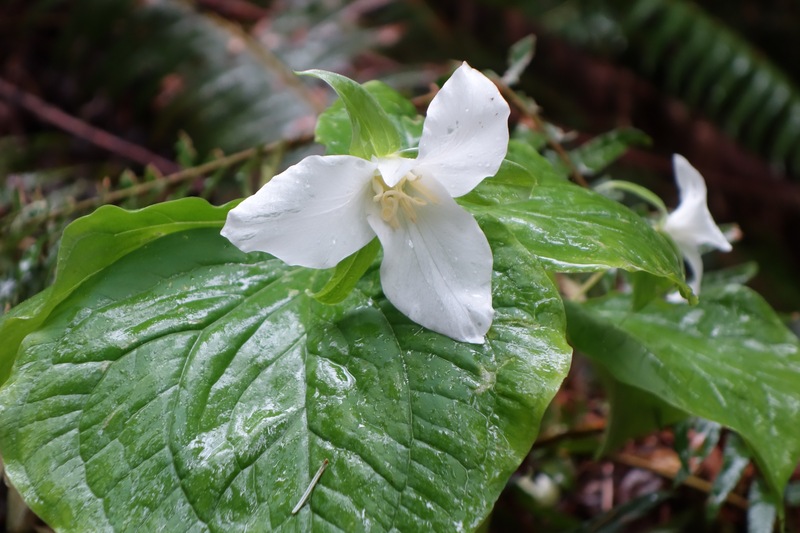 This one is a few miles WNW of Mount Baker near the Heliotrope Ridge trailhead. 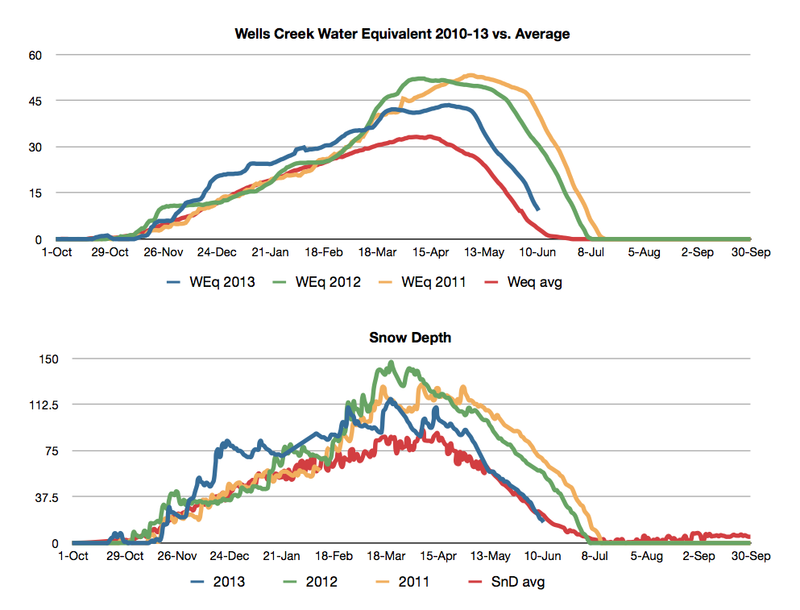 The graph shows the water equivalent of the snow on the ground – essentially a measure of the weight or mass of the snow. This gives the best estimate of the meltwater that is going to be available to water crops the following summer, which is what the SCS is interested in. The squiggly red, orange and green curves are for 2011, 2012 and 2013, respectively; the smoother purple line is an average for most of the 15 years or so that the station has existed. 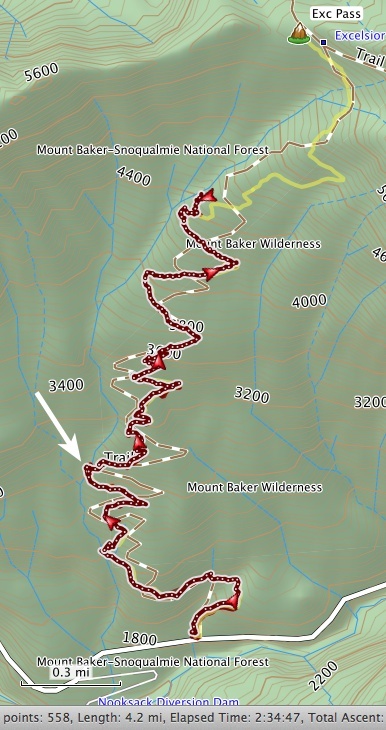 For us hikers, the most pertinent thing is the point where the curve drops back to the axis, indicating that most of the high country hiking trails will be snow-free. 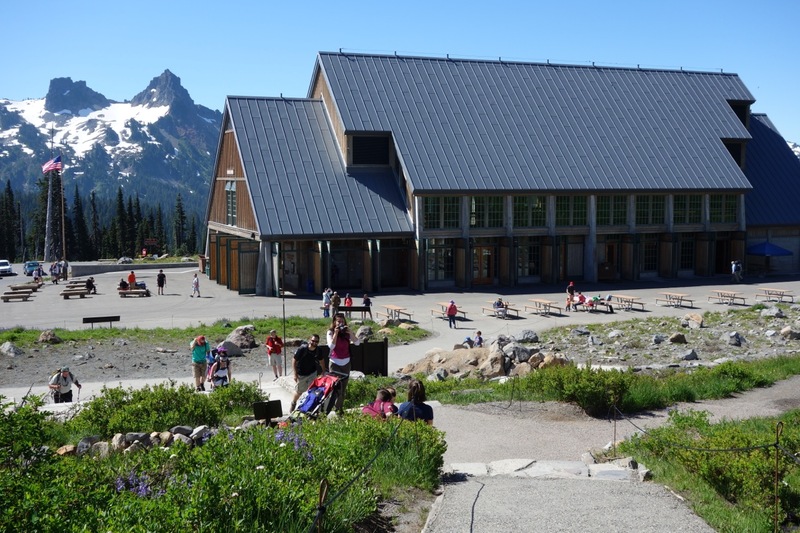 Recall that 2011 (red) was the year that the DOT (Department O’Truckin’) could not open the road to Artist Point. And last year (green) there was above average snowfall but it melted so quickly that the hiking trails were available a bit early. You have to look closely (or expand the picture) to see this year’s dark blue curve – it has been below but very close to the average for the water year so far – you can see a little uptick in response to the recent storms. The thing that always strikes me first about this graph is the way the curves are clumped pretty close to average until about this time of year. The high snow years didn’t really start moving off average until February or, in the case of 2011, even March or April. So the upshot is that we are having a fairly average year. And what does that tell us about next summer hiking? Nothing. Or maybe less. But talk to me again in April. 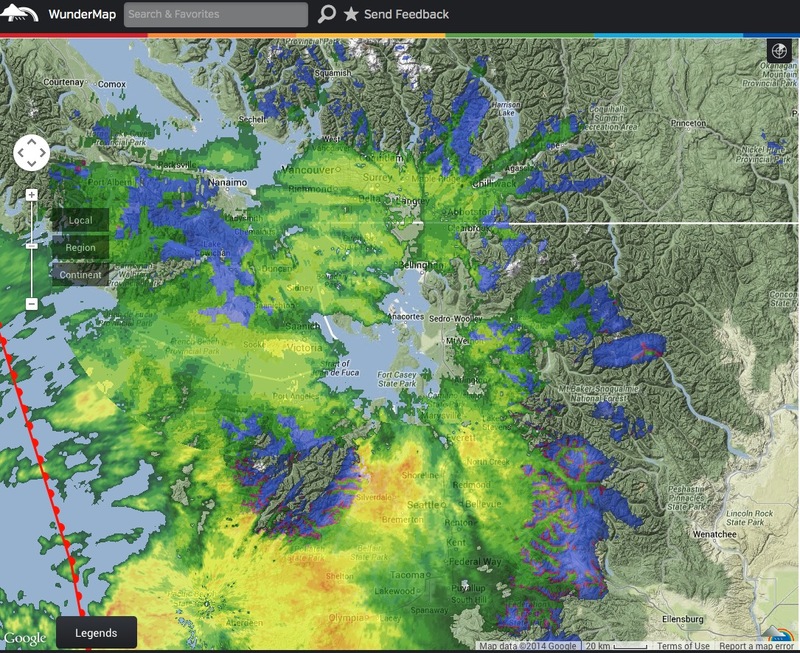 I close with a screenshot from this morning of the weather radar over NW Washington – it gives a vivid picture of the Olympic Rain Shadow. The precipitation pattern looks like a doughnut with a big hole over Whidbey Island and the eastern end of the Strait of Juan de Fuca. The story here is that storms, like this one, tend to come in from the southwest, riding the prevailing winds. The first terrestrial obstruction they encounter is the massif of the Olympic Mountains, which drives the air up and wrings the moisture out if it. Places on the windward flank like Aberdeen and Forks will get massive amounts of rain (100″ per year or more) while spots in the lee, such as Sequim and Port Townsend, receive Arizona-like rainfalls of 10″ or less. There is another gap in the rainfall pattern directly over the Olympics, but I’m going to put that down to the fact that the radars, being located down near sea level, do not do a good job of seeing rain in high mountains. The main radar station in this area is located on Camano Island and has a clear view out over the water but not up into the Olympics. BTW this image is from the “WunderMap” produced the weather site called Weather Underground. The name is kind of a snarky reference to the radical 60s group but it’s the best weather site I’ve found. I especially use their link to the Scientific Discussion to get a behind-the-scenes look at the forecast. Last Sunday morning as I was getting dressed to sing in my church choir I noticed a peculiar phenomenon as I looked out the window. The sliding glass was open about 8 inches and the screen was adorned with small droplets of dew, but only where the window was open. The vertical black bar in picture is the frame of the sliding portion; to the left we are looking through the window glass and the right side is open to the outside air. 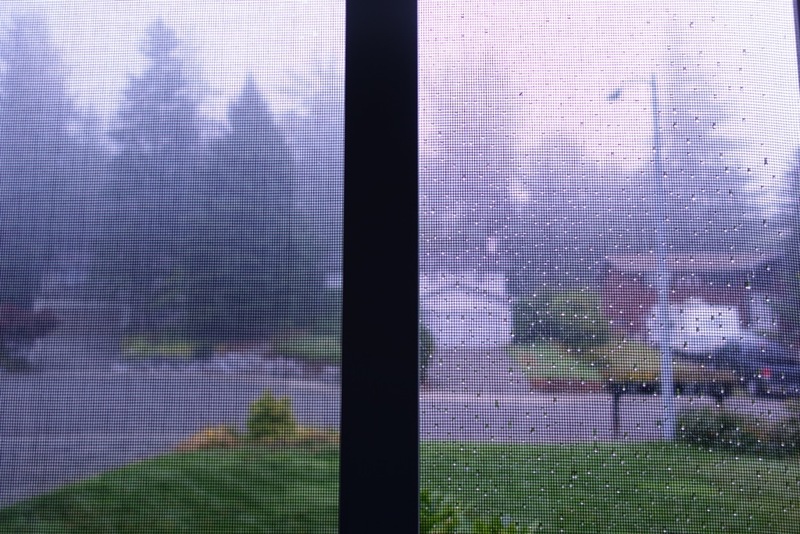 The screen lives on the outside of the frame so all of it is in the foggy outside air – why is there no dew where the screen is outside the glass? My first thought was that the open side was exposed to the relatively warm and drier air in the house (it was pretty clearly about 100% humidity outside) and so should be less likely to form dew. The droplets are rather washed out by the backlighting near the top so the pictures may not be convincing, but take my word for it. 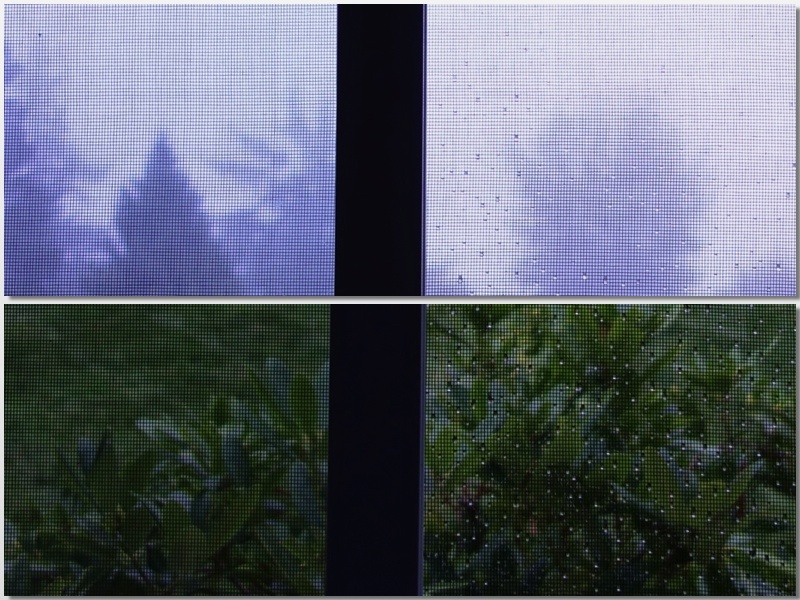 Here’s what I came up by way of explanation: The outside air was saturated with moisture but it was quite still. Under such conditions the humidity can actually exceed 100% (supersaturation) because water vapor doesn’t really like to condense unless there is something to condense ON. But where the colder and heavier outside air met the warmer inside air, it started flowing through the screen into the house. Any sort of disturbance can be enough to get supersaturated air to start condensing on whatever is handy. And that inflow of air meant that some inside air had to get out somehow. So I’m picturing cool air flowing in through the lower part of the screen, producing lots of condensation, and warmer air escaping through the upper part, evaporating some of the water. I was able to get the screen into sharp focus since my new camera allows manual focus. Better yet, it has a “Manual Focus Assist” feature that temporarily blows the image on the camera’s screen up to the maximum, right to the pixel level, so you can really see what you’re getting. Very cool. I am on jury duty this week and next. I didn’t have to go in on Monday but I was called in today and sent in with a panel for jury selection in a criminal trial. I shared some misgivings I have from my last jury experience and was peremptorily dismissed by the prosecutor. I actually sort of wanted to get on that panel since it was expected to be a 1- or 2-day trial, meaning I would likely be off the hook for Thursday’s hike. As it is I will call in on Wednesday evening for my next assignment, which could be on Thursday, of course. But if they go in any sort of predictable rotation there’s a decent chance I might be free for the hike to Lake Ann. Since we are planning to go up the Excelsior Pass Trail on Thursday, I had planned to go up today and check out the snow level. But I’m still feeling the effects of a very big weekend of choral singing. And there are those two blisters on my little toes from the long flat hike last week – it’s always the flat hikes that give me trouble. Anyways, I stayed home and mowed the lawn and lazed about the house. 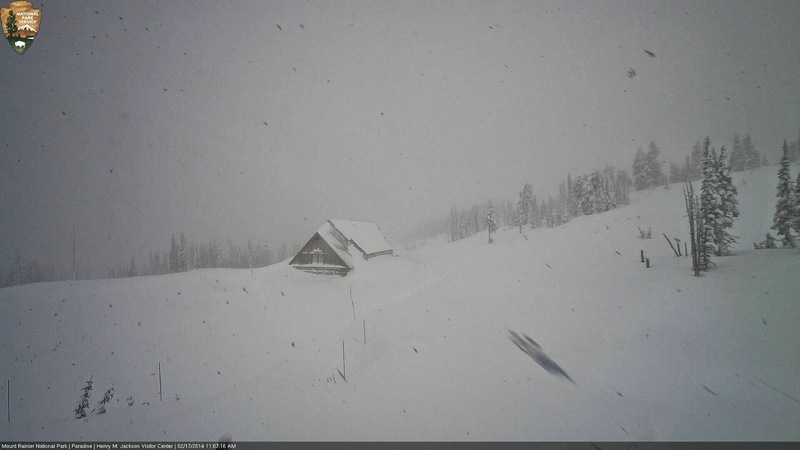 Luckily the good folks at the National Weather and Climate Center of the National Resource Conservation Service, part of the Department of Agriculture, have been kind enough to install some remote snow monitoring stations in the North Cascades and elsewhere. I’ve built a little spreadsheet into which I can download their data and generate some graphs. The graphs to the left show the situation about a thousand feet feet below the Cougar Divide trailhead along Wells Creek Road – about 4000 feet above sea level. The lower graph shows the actual Snow Depth and the upper one the “Water Equivalent” of that snow – how deep the water would be if you could melt all that snow and somehow keep it from running off down the hill. It basically measures the total mass of the snow, ignoring the air that is trapped therein. The red lines are the averages of “average” years – I graphed all the data and saw that they tended to clump together, except for a few years that were much lower or higher than the others. So I dropped those “outliers” from the average. 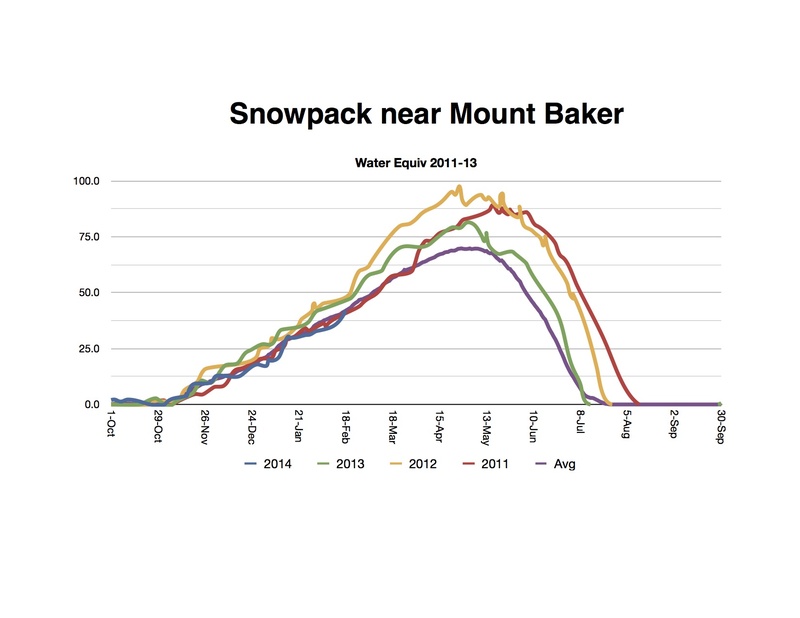 The orange and green lines are 2011 and 2012, respectively, which were very heavy snow years. 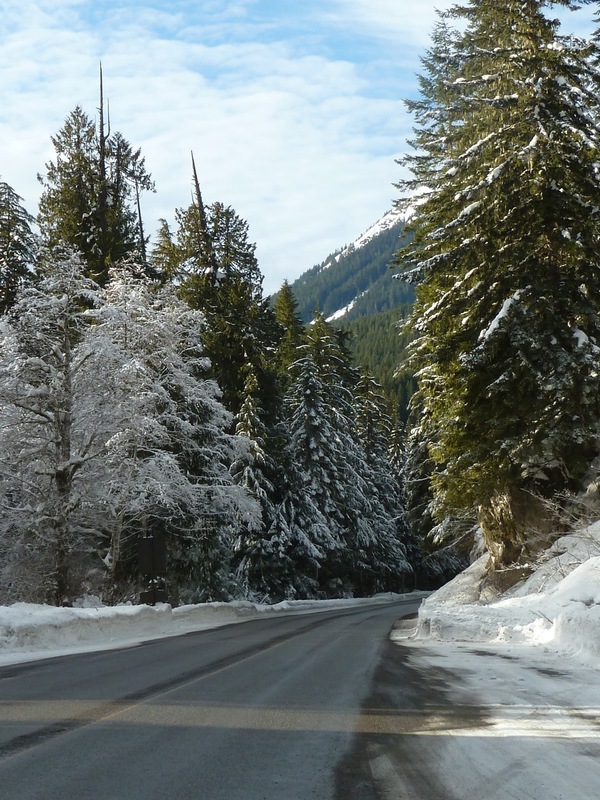 In 2011 the Department O’ Truckin’ was not able to clear Mount Baker Highway to the end. And blue is this year. On the Snow Depth chart we are already below average and the Water Equivalent is dropping steeply; it is down to 8.5″ and decreasing about 1″ per day. Now this information has to be taken with a grain of salt – it is only one spot in a region of tiny microclimates, the sensors have not been seen or touched by a human since the road closed last fall, etc. But the year-to-year comparison has a good chance of being valid. But I’ll present it as pretty good news for hikers. We had a lot of snow in the middle of winter but it seems to have stopped (pretty much) quite awhile ago and has been melting like crazy in the recent warm weather – remember how Hidden Creek was roaring last week. 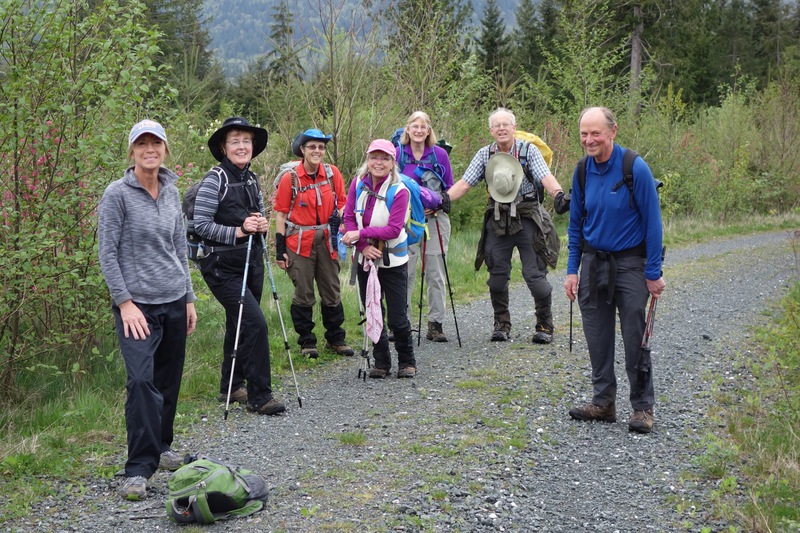 And the place we are hiking this week is directly across the North Fork Nooksack Valley – a little further from the “snow fence” effect from Mount Baker (so there tends to be less snow) and on the south-facing side of the valley (so it melts faster). Getting to the Pass (over 5000′) is very unlikely, but I think we have an excellent chance getting to 4000′ feet without hitting snow, which would give us a nice hike in the woods and over two thousand feet of elevation gain. And, of course, we can always continue for aways on the snow – traction tires are advised. 1. It is my impression that the Water Equivalent, while harder to picture, is the more dependable of the two measures since it is easier to measure. Last Thursday an even dozen of us geezers made the long drive down through Skagit County, despite the risk of being caught up in the traffic due to the the recent collapse of the I-5 bridge over the Skagit River, around to the east side of Mount Baker and all the way up to the top of Baker Lake to hike the East Bank Trail as far as the mouth of Noisy Creek. It is a wonderful hike through an old growth forest above the shore of Baker Lake, about 10 miles round trip with roughly 1000 feet of ups and downs along the way – not usually enough to justify a 140 mile round trip drive, but we are getting pretty tired of hiking on the coast and eager to get into the mountains. This area is less than 1000 feet above sea level so the winter snows, if there were any, are long gone. But there was plenty of snow on the high ridge above us, as evidenced by the roaring meltwaters in Hidden Creek, which we crossed about halfway along. That smokiness in the background is not fog or mist, since it was warm, dry day – it is all spray from the creek. We had to shout to be heard over the waters’ roar while standing on the bridge, and this isn’t even the one they call Noisy Creek! A few months ago I blew part of my daughter’s inheritance on a new camera and I’ve been meaning to publish some of its pictures and describe its cool features, but for now I’ll just show a couple. The main reason I bought the new Sony RX-100 is that it has a larger light sensor than most point-and-shoot cameras, making for less “noisy” pictures. When one crams a whole lot of pixels into a tiny sensor, the electrons can “leak” from on pixel to another, giving a messy, smeared effect especially in low light situations. The larger sensor will allow me fewer excuses – on another day I will show off more of its abilities. The picture above is cropped from a vertical, about 30% of the original. It is not a great picture but it shows pretty good color rendition in low light. At our destination we enjoyed a splendid view of Mount Baker including as a special treat a substantial cloud of steam from the crater. The crater is that notch between the two peaks (named for Generals Sherman and Grant). It is always giving off steam but it is often obscured by other cloudiness or blown away by strong winds. It is my understanding that the steam does not come directly out of the volcano, but results from the ever-present snow at that altitude melting and seeping down into cracks until it is boiled off by the hot magma that lies below the surface. And that picture is not a great one, either, but it is an example of one of the new camera’s many fancy tricks – it automatically noticed that it was an extremely high contrast situation, from the hikers in the deep shade on the beach to the snow on Baker. In a single image either the hikers would be black silhouettes or the mountain would washed out to bone white. This camera, without being asked, took three quick pictures at different exposures and blended them into one. This is called High Dynamic Range (HDR) processing and has been available as a post-process after the images are uploaded to the computer but this gadget does it on the fly. Near the end of the hike, as we approached the trailhead, I glanced at my GPS and noticed that it was indicating that we were quite far from the track that it had it had recorded in the morning. I was pretty sure there weren’t two trails! And sure enough, when we got back on to the earlier track there was no second trail and no sharp turn. The picture on the right (you can click to enlarge it) shows a number of tracks from previous times we had hiked this trail all looking roughly the same and the new one, in bright red, following along with the others but then turning sharply to the right and bouncing around a bit before resuming a northeasterly course roughly parallel to the true one. It even shows us going well out into the river (I think we would have noticed that!) before getting its act together at the bridge. Now I don’t watch the GPS all the time, but I had noticed in the morning that it was showing an accuracy of about 30 feet. However that spurious track is a couple of hundred feet from the true one. We were in a pretty deep valley but it was a clear day in a light forest and all the rest of the track looks pretty normal. And then there was the time on the Cub Creek hike on Stewart Mountain east of Bellingham – again a bright, clear day, near the top of the mountain with a hill on one side blocking some sky but not much. And this time we were walking on a level road so the tree cover was minimal and the true track was right there on the map on the GPS device. We were proceeding east-to-west when the track veered off, again keeping the same general shape – notice that there is a small, gentle inflection about halfway along that shows on both tracks. In this case the red track takes a sudden screeching turn to the left and zips back to the road. So how is this possible? The GPS knows nothing about its direction of travel (I usually have the compass feature turned off since it eats a lot of battery time) or the shape of the trails – it just receives signals from a number of satellites that allow it to triangulate its location. It is supposed to know where it is at any time, but that’s all. And if the signals are weak or otherwise inadequate the device will show that by raising the “accuracy” distance or just bailing out entirely. In these cases it appears that the device was still receiving signals that were good enough and consistent enough to allow it work through its algorithms and come up with what appeared to be a “good” answer. And they were good enough to get the overall shape of track correct. The Explanation ? ? ? I was musing about this with DJan at the end of the Baker Lake hike and I remembered that at the time of the Hoypus Hill hike someone (probably DJan herself) had mentioned that we were in a period of high sunspot and solar storm activity. And she said that that was true again now! I know almost nothing about such things but I poked around a little on the Interwebs and confirmed high activity on Thursday and higher yet on the Hoypus Hill day; Cub Creek was middling, but definitely not low. Again, I have no idea how solar storms could do this, but a burst of radio frequency noise could conceivably fit with the notion of a widespread but temporary disruption of radio signals – after all those satellites are way up where the solar wind could get at them. But still this is deeply weird. The only lesson that one can surely take away from this is to be very careful about trusting a GPS device. They work very well most of the time but you should always be looking for the possibility of error. 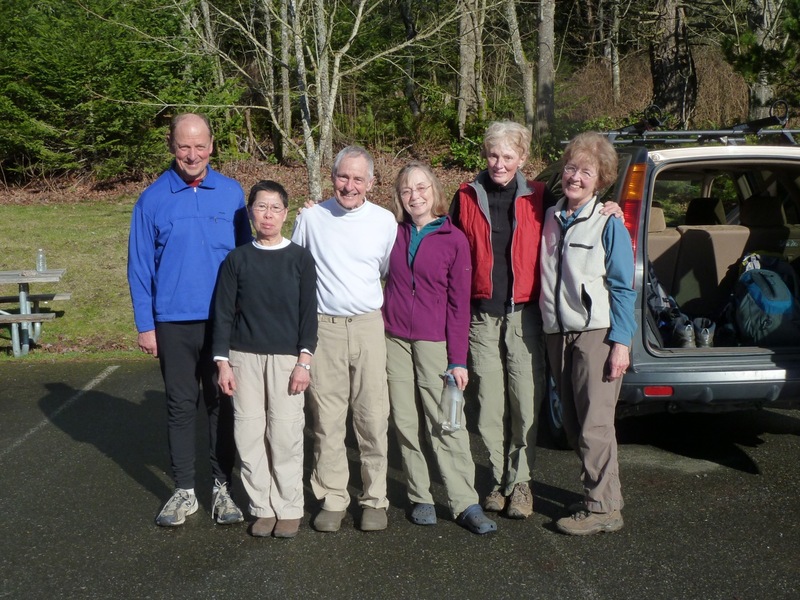 Yesterday the Senior Trailblazers took our weekly hike, this time to Gates Overlook in the Chuckanut Mountains. 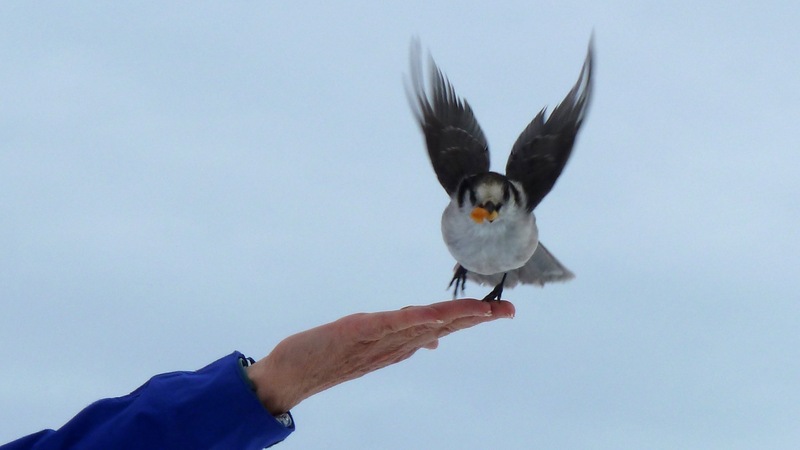 In addition to covering almost 2000 feet of elevation change there was a front coming through, so we encountered a broad range of weather as day went on – fog, drizzle, snow flurries and brilliant sunshine. My pictures were pretty poor but I’ll include a few to make the post look more interesting. But the main impetus for my current bloviation was something I read in another blog. In my last posting I included a link to the Cliff Mass Weather Blog, since he is generally considered to be the Go-to Guy for weather around here. I am starting to regret that after reading his most recent post, where he made a really stupid comment. Finally, the meteorological honor of Seattle citizens is at stake. Atlantic Monthly has called us “weather wussies” because we are sensitive to a little snow. Let them check out our hills or the ice that tends to develop after light snow. Consider that East Coast types, such as the Atlantic editorial staff, give names like “Storm of the Century” and “Perfect Storm” to events that would invoke a tepid shrug from a Northwesterner. We know who the real weather wimps are. Can he really think that there are no hills or ice east of the Cascades? And is he really sneering at the tornados, blizzards and hurricanes that occur every year elsewhere in the country when he has to dredge up fifty year old storms like the “Columbus Day Storm” to get a decent example of inclement weather? Is he saying that a city that vilifies and throws away a perfectly good mayor because he didn’t show adequate deference to the city’s courage in facing a modest snowstorm deserves to call anyone a “weather wimp”? I love living in the Pacific NW, where we have been for the last 13 years, and would not gladly move anywhere else. But one of the main reasons is that the weather is so incredibly mild. One a fairly typical day recently, in the middle of “winter”, the temperature swung wildly all the way from 39 to 40 degrees! As a general rule the best way to forecast the weather for tomorrow is to look out the window today. On our hike yesterday we encountered drizzle, snow and bright sunshine, but we had to climb to 2000′ above sea level for that – in town they had mild sunny weather all day. And I love the fact that snow is available throughout the year, but not in my driveway! Of course everyone wants to believe that one’s own experiences are the toughest anyone has ever faced, and faulty memory can gild one’s lily (“Why when I was a pup, we walked to school fifteen miles in 40 below, dadgummit!”) but seriously, folks, even a tiny garden-variety tornado is probably more intense than anything the NW has ever seen. The one thing that is not mild here is the wind and that may help explain why NW natives can convince themselves that the weather here is harsh. 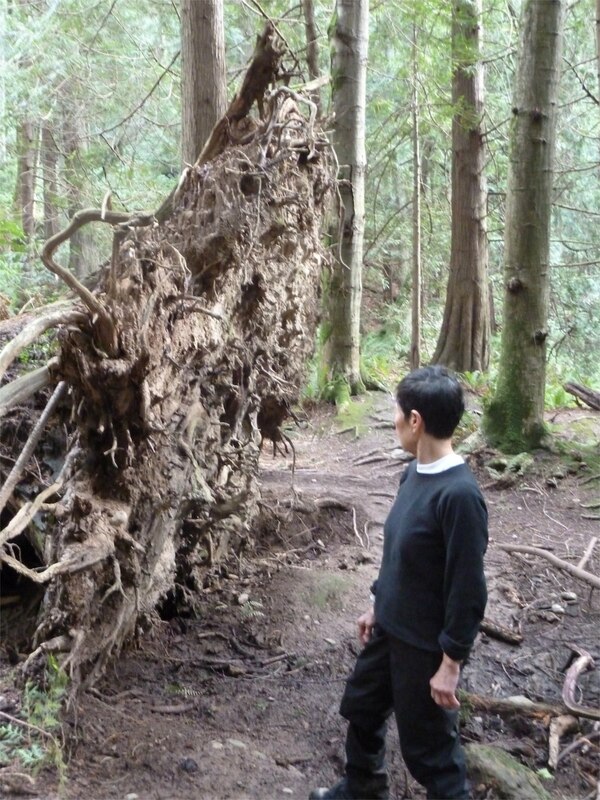 We get frequent windstorms that blow trees down left and right – we find fresh “blow-down” on almost every hiking trail in almost every winter. And that is not something I remember seeing much of before I moved out here – a big ice storm might break branches off trees, but a huge, mature tree just toppling over is not a common sight most places. But I think that may have more to do with the nature of the trees than with the strength of the wind. 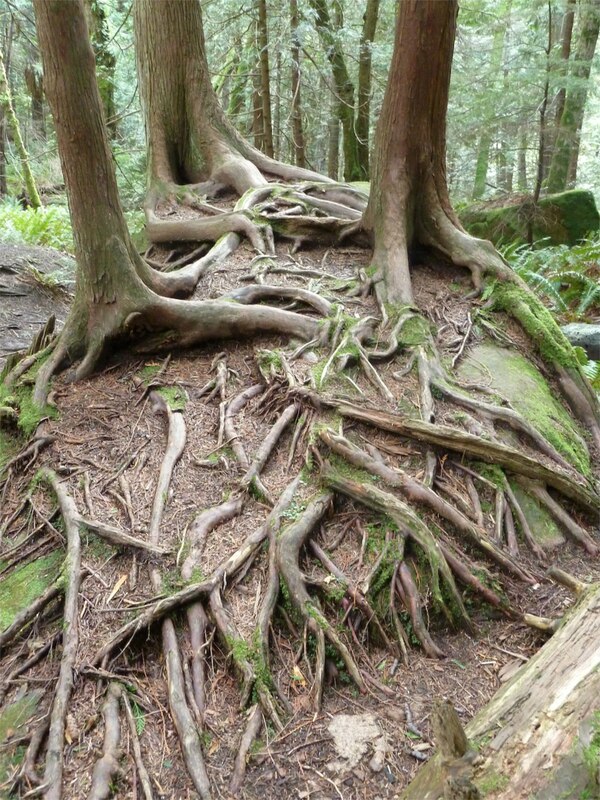 Most of the trees that topple are big cedars, hemlocks and firs that have very shallow root systems, lacking the big tap root that most trees drive deep into the ground to serve as an anchor. The geology does not permit such deep roots, since in most places other than broad river valleys there is only a thin layer of soil over the bedrock. 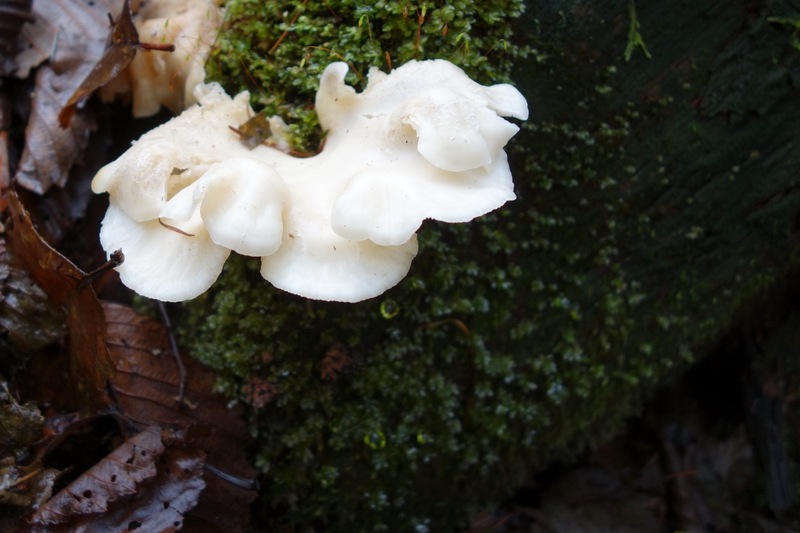 On yesterday’s hike down the Fragrance Lake Trail in the Chuckanut Mountains south of Bellingham, as I was thinking about writing this posting, we came across an almost perfect illustration of this phenomenon. In the photo on the left Amy (who is only about 5 feet tall) is giving scale to a fallen tree. This would be called a “root ball” in a horticultural publication, but root “disc” or “plate” would be a better word. These large, flat root masses are a very common sight around here. This one is about 8 feet across, but they can be much larger; there is one at the north end of Lost Lake that must be about 20 feet tall. Right behind where Amy is standing is a fine illustration of the reason for these “plates”. What you are seeing is a set of three decent sized trees (trunks are a foot or two in diameter) with their roots spreading across on top of a large boulder. Only in the lower right hand corner can you see the roots making contact with anything that passes for soil. Another phenomenon associated with these fallen trees is called a “nurse log” – as a fallen tree gradually decomposes you will see other plants and even whole trees growing directly on top of the log and drawing their nourishment directly from the log. This boulder is providing very little nourishment, I imagine, but I can’t resist calling it a “nurse rock”. By the time we got back to the trailhead the little bits of sky that we had seen poking through the clouds for most of the day had coalesced into a glorious wall-to-wall blue. This allowed me to get one picture of the group without the blur of a shaky camera. I’ve been kind of lazy about posting lately, so I have a backlog of weather-related things to spout about. 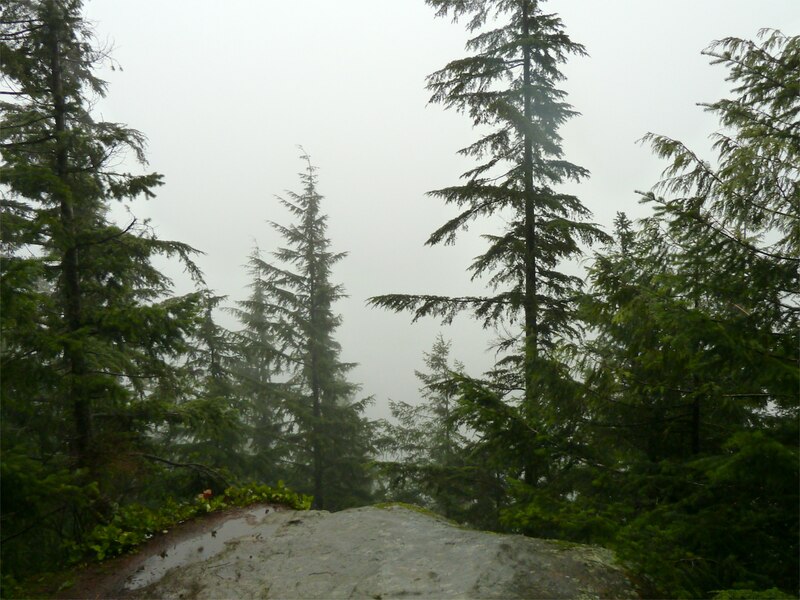 A couple of weeks ago western Washington experienced a protracted temperature inversion. Usually the temperature of the air decreases as you go to higher altitudes (during the daytime, at least) due to the fact that the sun’s energy heats the ground faster than it heats the air, whereupon the warmer ground proceeds to heat the air from below. This situation is a bit like a pot of water on the stove: the lower layers are warmer, but warm things (generally) are lighter, so we get an instability where the warm stuff rises and the cooler falls, and everything gets all stirred up and burbly. But the thing that breaks that cold layer down and makes our daily atmospheric pot roil and boil was that business about the sun heating the ground – which doesn’t happen so much here in the winter. We sometimes forget what the sun looks like for extended periods of time. Anyways, now and then conditions converge that allow that frosty layer to persist for days and grow to hundreds of feet thick. And that layer is quite stable, with the heavier, colder air at the bottom and warmer at the top. Usually we think of stability as a good thing but in the atmosphere it has the downside that the air just sits there, allowing all the dust and nitrogen oxides and other crud that we are so good at spewing to build up and form a low-lying smoggy cloud that further inhibits the sun from warming the ground, and so on, and so on. Another side effect of the inversion was that it gave us an extended period without new precipitation, allowing the snowpack in the mountains to settle and consolidate and bringing the avalanche danger down into a comfortable range. Just a day before the inversion was broken by the arrival of a strong Pacific storm Amy and Jan joined me as we left the gloom of the lowland smog for a snowshoe outing near the Mount Baker Ski Area. We were only a few miles from town and a few hundred feet in elevation when we passed out of the inversion layer and the sun broke through. As we continued up Mount Baker Highway along the North Fork of the Nooksack River just before the road turns and climbs steeply to the Ski Area, we were admiring the heavy layer of snow on the trees along the road when it occurred to me that there hadn’t been any noticeable precipitation for about ten days. Snow on the trees is a pretty common thing up in the mountains, but we were seeing something that you usually see the morning after a heavy snow – these evergreens are shaped to shed the snow pretty quickly. 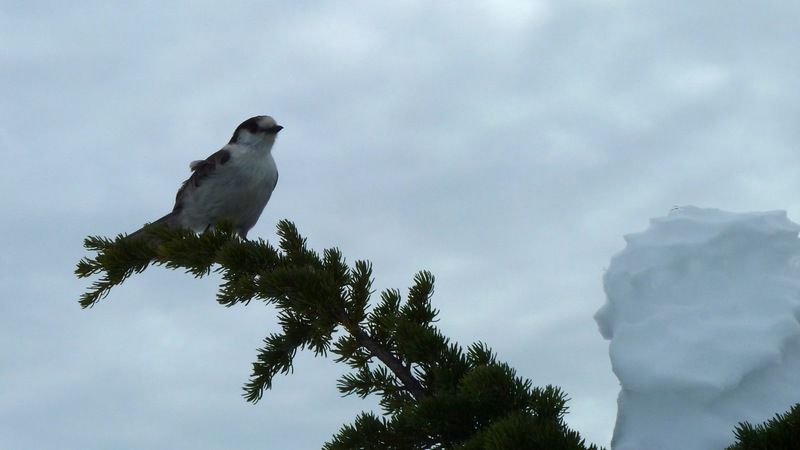 Furthermore, the trees on the surrounding hillsides, and even the tops of some of the taller trees, were completely bare, so the snow was not fresh – how had it hung around for so long? I puzzled about this most of the day and it wasn’t until we were on our way back to town that it made some sense. Maybe that snow wasn’t snow at all but a heavy layer of hoarfrost that had built up for days. Or maybe a combination of both. There is a phenomenon in the mountains called “cold air drainage” which results in localized inversions – the cold night air drains down the river valleys and picks up fresh moisture from the unfrozen river. While we were above the level of the coastal inversion, the calm stable weather meant that there were no windstorms to knock the snow off the branches. The sun had melted the tops of the trees but the snow had persisted or even grown with hoarfrost in the shade along the river. I wish now I had spent more time trying to get some better pictures since this was such a combination of things that I might just never see it again. We had a beautiful day for snowshoeing although the weather system that would ultimately break the inversion down was heading in from the west, making for some interesting skies. On the picture on the right you can see in the clouds a dark V-shaped pattern pointing toward the sun – just one of a number of odd fantastical shapes that we saw. I will tack a picture gallery at the end of the post. That snowshoe outing was on Tuesday, January 22, and by Thursday the inversion was pretty much gone and we had a nice sunny hike to Alger Alp. 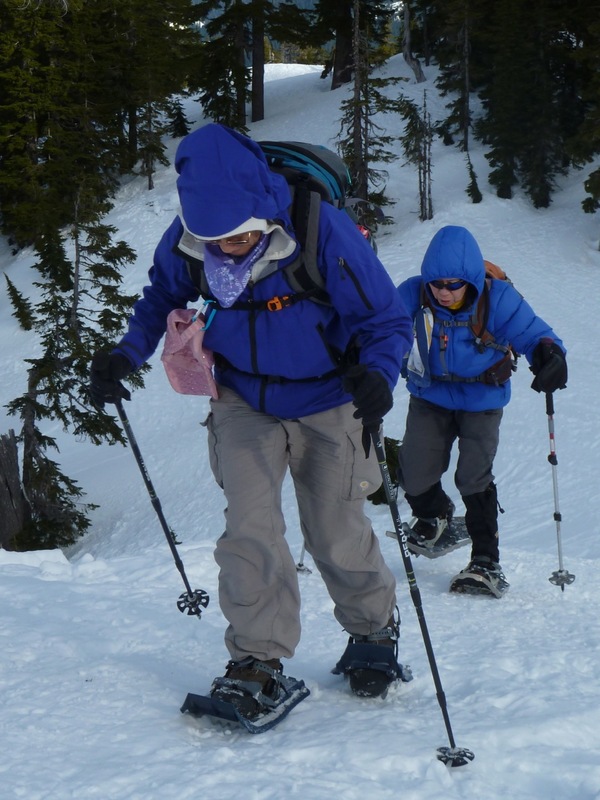 [As always, you can read about that hike on Jan’s blog, D-Jan-ity.] 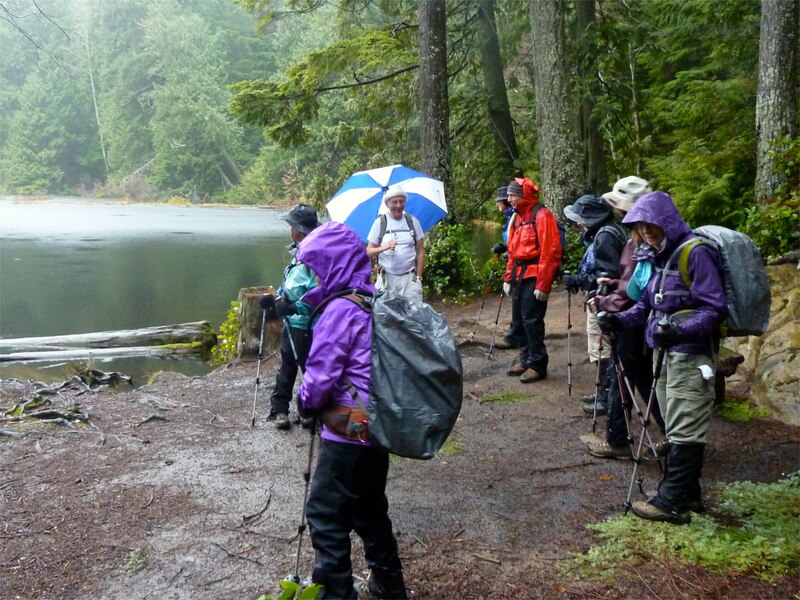 But another week later we were back to full-blown normal, a bunch of crazy geezers hiking in the chilly rain to Pine and Cedar Lakes. 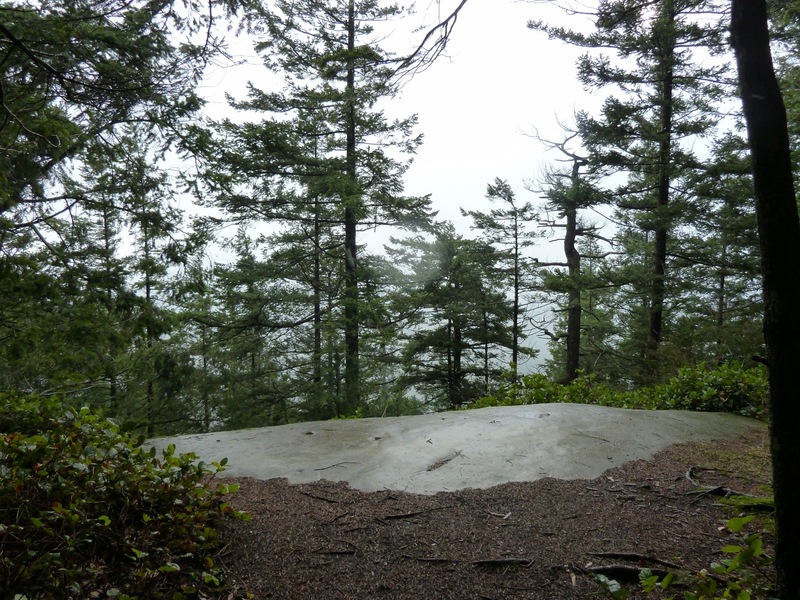 After visiting the lakes we hiked on over to Raptor Ridge, not so much for the view but because of the overhanging rock ledges that form shallow caves and provide some shelter from the wind and rain. 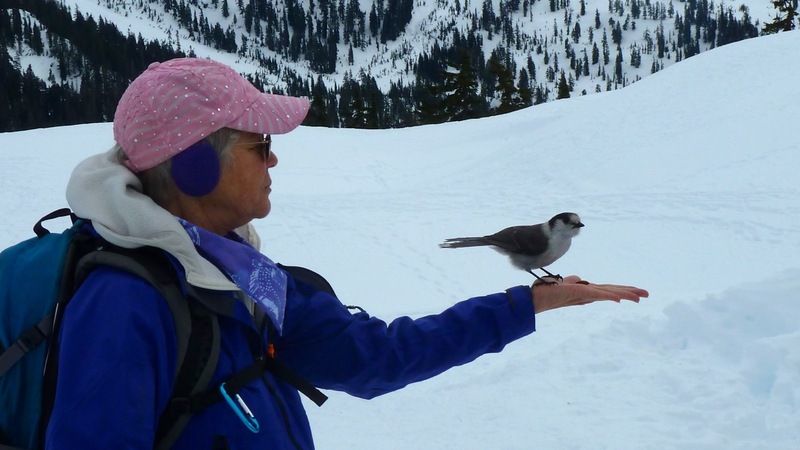 This year’s line is a little above “normal” but not enough to make a prediction – it seems to be the late season snows that have the most effect on the hiking season. Notice that in 2011, the year they couldn’t open the road to Artist Point, the snow depth was pretty average until well into March but then it snowed like crazy through most of May and it didn’t clear until mid August. Last year was a bit on the high side at this point before the ceiling fell in and it snowed through April.